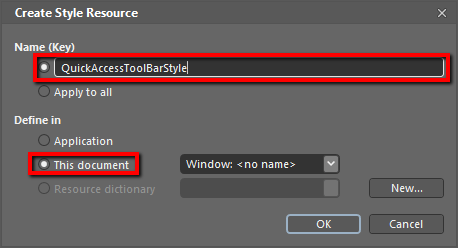 The RadRibbonView QuickAccessToolBar control can be styled by creating an appropriate Style and setting it to the Style property of the control. In order to copy the default style, load your project in Expression Blend and open the User Control that holds the RadRibbonView. 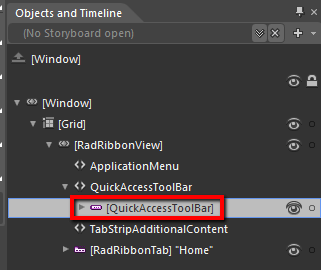 In the 'Objects and Timeline' pane select the QuickAccessToolBar you want to style. After clicking 'OK', Expression Blend will generate the default style of the QuickAccessToolBar control in the Resources section of your User Control. The properties available for the style will be loaded in the 'Properties' pane and you will be able to modify their default values. You can modify these properties to achieve the desired appearance. However the most of the visual parts of the QuickAccessToolBar have to be styled in the template of it. To modify it select the style in the 'Objects and Timeline' pane, right-click on it and choose Edit Template -> Edit Current. In the same pane the element parts for the QuickAccessToolBar's template will get loaded. You can also modify the trigger defined for the QuickAccessToolBar. It is located in the 'Triggers' pane. With R1 2017 we introduced predefined styles inside QuickAccessToolbar, so in order to style its items you can use QuickAccessToolbar's ItemContainerStyleSelector property. Finally, you shold define the two custom styles and assign the QATItemContainerStyleSelector to the ItemContainerStyleSelector property of the QuickAccessToolBar. This example is implemented with NoXaml Binaries and the styles are based on the default styles for the theme.